If you plan to hit up Sugar or Beech this year, turn to the folks at the recently relocated Snow Toys shop for top-notch customer service and high quality equipment rentals. The new Snow Toys storefront at 40 High Country Square in Banner Elk. We specialize in helping people that have not necessarily been skiing before or they’re fairly new at it, and we really stress customer service here,” said Ric Crosby, who bought the store with his wife, Edi, in 2010. “My guys will get down on the floor and help you get the boots on to make sure they fit you well. In the fall, Snow Toys moved across the street from its old location to a new storefront at 40 High Country Square. Now located directly across from the Best Western Mountain Lodge on Tynecastle Highway, the new store in the High Country Shopping Center offers more than 1,000 square feet of floor space. 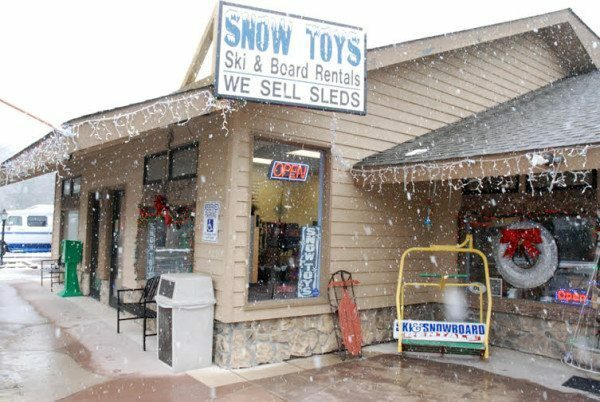 Although unseasonably warm weather in November and December made for a late start to the ski season, the temperatures are finally dropping and foot traffic is finally heating up at Snow Toys, which typically accommodates 200-300 customers on a busy weekend. Shop owner Ric Crosby is pictured in the Snow Toys ski shop in Banner Elk. Snow Toys offers the best in rental equipment, including skis, snowboards, blades, helmets and goggles in popular brands like Atomic, Salomon, K2 and Burton. If you’re only making one trip this year and don’t need to invest in your own ski clothes, you can also rent the gear you need to keep you warm. It’s also the High Country’s go-to stop for sleds and tubes, and features a variety of specialty merchandise you won’t find at the resorts. You can also shop a variety of ski socks, headwear and masks, Yaktrax, ski wax, sunglasses, fun beards and more at Snow Toys. Whether you’re new to the winter sports game or you’re a seasoned vet, excellent service from qualified professionals is not a luxury, but a necessity. That’s why Snow Toys employs five certified ski technicians who are always prepared to match you up with the perfect gear and make sure that you know how to use it. A Snow Toys employee is pictured inside the ski shop in Banner Elk. The pros at Snow Toys know they’re the beginning of your winter sports adventure, and they prefer to go the extra mile to make your trip great from the start. Make your reservations today at 828-898-4199 or online at snowtoysnc.com. Trust Snow Toys with your equipment needs and you’ll make new friends you can always count on for safe and exciting winter adventures in the High Country. Winter weather arrives at Snow Toys in Banner Elk in January.